This post is dedicated to one of our favourite hotels in Italy: the MGallery LaGare Venezia. Why is it so great? It has good staff, beautiful rooms and can be great value. The MGallery in Venezia is actually on Murano, so not on the main island. This need not be a problem. First, they have a free shuttle boat that can collect you at the airport and takes you to the hotel in some 20 minutes. Book well in advance, it's a popular feature. Second, near the MGallery there is a tabaccheria where you can buy 1, 2, 3 or 7 day passes for the waterbus (cash only). 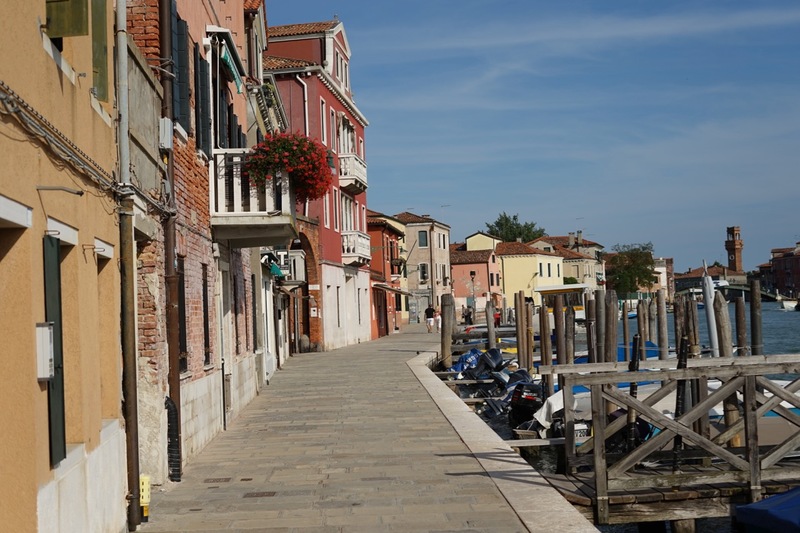 Right before the hotel, there is a waterbus stop where you can catch a boat to either the Santa Lucia central station (west side of the main island) or Fondamente Nove at the north east side of the main island. For a longer boat trip along the east side of Venice, reserve an hour or so. It's worth to do at least once because you also get to see the more industrial side of the main island. That will pay out, because a single ticket on board will set you back 7,50 euro. For 3 days of unlimited waterbus travelling you pay 40 euro per person. If you're planning to visit Venice a lot, consider heading to the main waterbus terminal at Piazzale Roma, where you pay 50 euro for a personalised travel pass which entitles you to load single journeys for only 1,50 euro (90 minutes validity). You need to reserve some time for this; for the clerk it's a lot of paperwork. Now here's how to get a maximum value deal out of the MGallery LaGare Venezia. First, if you plan to visit hotels of the Accor hotel group more often, you can get yourself instant gold status in their loyalty programme by buying an IBIS business card. Rest assured, I have not slept in an Ibis hotel in at least 10 years but this card costs 89 euro a year and entitles you to instant gold status for the entire Accor hotels network. Main perks: early check-in, late check-out, welcome drink, room upgrade. Most of these advantages are not guaranteed though. Once you have your status, remember that you'll have to book directly through the chain's own website to enjoy the benefits. If a room can be booked much cheaper elsewhere that might be the way to go. I myself never bother about lodging 'price guarantee' claims but you might also try that. Before you book, though, go to https://www.topcashback.co.uk (yes, I get a referral fee), make an account and make sure to find Accorhotels there. You'll get either 10,5% or 15% cashback on the complete booking. There's no catch, it will just take time (some three months after you stayed at the hotel the cashback will become payable). It will also require a UK bank account because Accor only pays through BACS, a UK payment system. Difficult? Well, here's where you can get a free UK bank account number: www.revolut.com (no referral fee). Ignore all the upsell attempts during the sign-up process, you won't need them - at least not to get your money into, e.g., a Dutch bank account. Now, how about the deals? There's regular Accorhotels actions that claim to get you 30 to 40% discount. This is usually in comparison to refundable rates so it's mostly 'optical', but sometimes the rate includes free breakfast. However, the Accorhotels site has a price calendar view that enables you to see rate fluctuations year-round. Room rates in Venice are very sensitive to supply and demand - obviously. So if you don't mind staying there in January (bring your boots for acqua alta) or March, or if you book well in advance, you can stay in a four star hotel in a room much larger than your average Venice room for below 100 euro a night (without breakfast) or slightly above 100 euro per night (including breakfast).